Noah’s Ark, which opened to the public in May 2009, forms part of the Ma Wan Park development at Ma Wan, a small island on which stand two “ends” of the Tsing Ma Bridge and Kap Shui Mun Bridge which form part of the Lantau Link between Hong Kong International Airport and urban Hong Kong. Ma Wan is also known as “Park Island” which is the name given to a large residential development on the island. Ma Wan Park including Noah’s Ark has been developed by Sun Hung Kai Properties and financed by three wealthy devout Christians, the Kwok Brothers and five Christian organisations, Chinese YMCA of Hong Kong, Angela Luk’s Educational Foundation Limited, St James’s Settlement, The Boy’s Brigade Hong Kong and The Media Evangelism Limited. Its mission is to promote family values, and teach love, social harmony and care for the environment. The developers have pledged that Ma Wan Park is in essence a community project and will not gain any commercial profit. Ma Wan Park was 15 years in the planning and was originally intended to be a commercial theme park with a large number of rides. However in order to minimise the overlap in concept with nearby Hong Kong Disneyland which opened in 2005 and also to conserve vegetation and preserve the setting of Ma Wan Old Village the developer subsequently proposed the park be developed with the theme of “Naturally Hong Kong” with the emphasis on retaining and refurbishing the existing structures in Ma Wan and conservation of the natural environment and cultural heritage. Plans based on this new concept were approved in 2003. 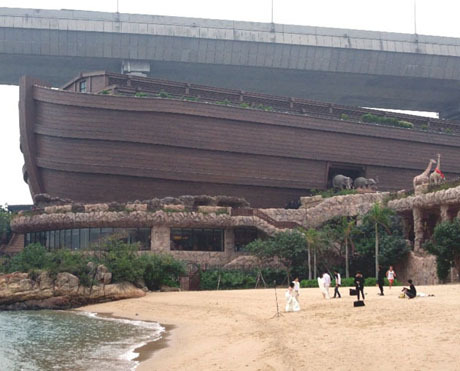 However Phase 1, costing an estimated HK$700 million, which was scheduled to be completed in June 2006 and comprises “Noah’s Ark ”,“ Nature Garden” and “Solar Tower”, ran behind schedule with the Nature Garden opening in July 2007 and Noah’s Ark in May 2009. 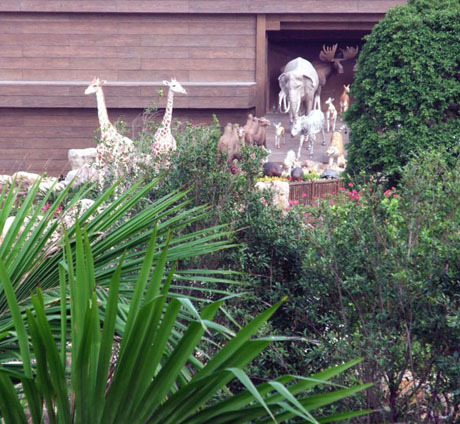 Prior to its official opening in May 2009 Noah’s Ark had been open for a few months on a trial basis to invited groups. The Solar Tower was opened in 2012, construction having been delayed until a revised road scheme for Ma Wan had been Shortly before the opening of Noah’s Ark, the ten-member Ma Wan Park Advisory Committee was set up to advise on its operation, maintenance and management with members being nominated by the Government and the developers. TAXI - previous restrictions on taxi access to Ma Wan were relaxed from 14th December 2012. Urban (red) taxis can now operate to and from Ma Wan/Noah's Ark 24 hours a day. Approximate fares, from Central district HK$240, Causeway Bay HK$230, Tsim Sha Tsui HK$180, Mong Kok HK$175, Hong Kong International Airport HK$130. FERRY - fast (catamaran) ferry services operate to Park Island from Central Pier 2 on Hong Kong Island at approx 15/30 minutes frequency until about midnight. The journey time to Park Island takes about 25 minutes. 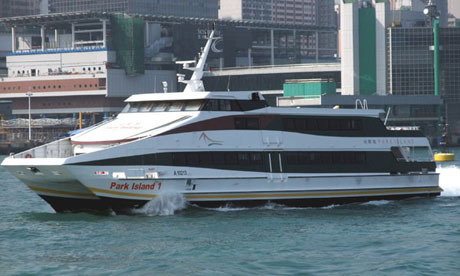 There is also a limited ferry service operating between Tsuen Wan Pier and Park Island. This service had been withdrawn in December 2012 owing to lack of demand but a limited service of three sailings a day was reinstated from June 2013. 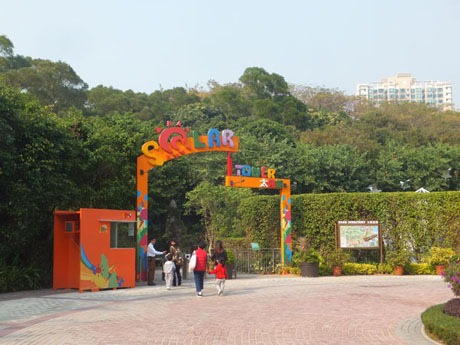 Ma Wan Park and Noah’s Ark are a short walk from Park Island Pier near the far end of Tung Wan Beach. 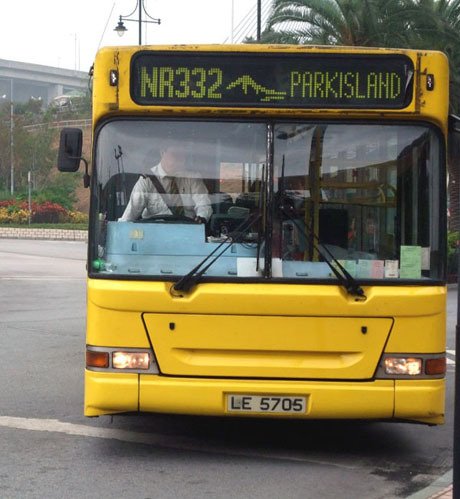 The service between Central Pier 2 and Park Island is replaced by an hourly bus service from 12-30am to 6-30am. Fare can be paid by Octopus Card or in coins for exact amount (no change given). ARK EXPRESS BUS - A bus service operates from MOKO (formerly Grand Century Place) in Mongkok (adjacent to Mongkok East MTR Station) to the main entrance to Noah's Ark at half-hourly intervals from 09-30 to 15-30 Monday to Friday and 09-30 to 16-00 on Saturdays, Sundays and public holidays. The journey takes about 20 minutes. Ark Express Bus return journey from Noah's Ark to MOKO operates half-hourly from 13-00 to 18-00 daily. There are also four bus routes serving Park Island from Tsing Yi MTR Station, Hong Kong International Airport, Tsuen Wan Bus Terminus and Kwai Fong. All these services stop conveniently close to Noah's Ark. The bus service between Tsing Yi MTR Station and Park Island is a frequent 24-hour shuttle service and the journey takes about 12 minutes. The Park Island Shuttle Bus departs from near Exit C underneath the station (it does not call at the public transport interchange adjacent to the station). NOAH’S ARK – Visitors are advised to book in advance online as the Ark has limited capacity and only a small number of tickets are available at the Park daily (subject to availability these can be bought from the ticket office at the entrance to Noah’s Ark between 9-45am and 5-30pm). Advance tickets can be purchased from Noah's Ark Ticket Office at MTR level of Grand Century Place, Mong Kok, all 7-11 convenience store outlets, and some hotels and shopping malls. NATURE GARDEN (MA WAN PARK) – Free public admission during public opening hours (see “OPENING HOURS” below). 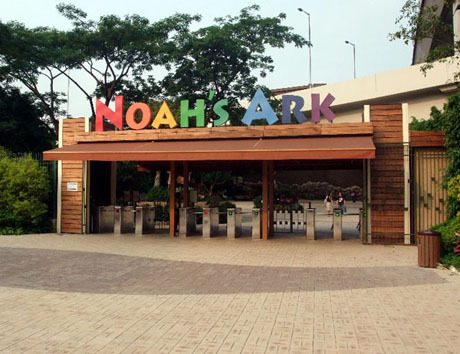 NOAH’S ARK – 10am to 6pm daily. Special late closing times may apply on Saturdays and Sundays in December and January. Refer to Noah’s Ark website for details. NATURE GARDEN (MA WAN PARK) – Monday, Friday and Saturday 1pm to 6pm. Tuesdays, Wednesdays, Thursdays, Sundays and public holidays 8am to 6pm. (Monday, Friday and Saturday mornings are reserved for pre-booked fee-paying groups for Exploration Activity). Closed first, second and third days of Lunar New Year. ARK EXPO (ground floor) – a multi-media exhibition describing Noah’s Ark, Noah’s Journey, the Great Flood and how this affects the world today. The expo uses sophisticated multimedia presentations including 4-D cinema presentation. The expo includes display of Ark models, meteorite exhibit and Microscopic Animal Kingdom. ARK GARDEN – Outdoor display of 67 fibreglass full-size replica pairs of animals, waterfalls, ponds, flowers and plants and learning activities to understand the importance of nature and the environment. Not to be confused with the separate Nature Garden. ARK LIFE EDUCATION HOUSE (first floor) – an interactive learning centre with multimedia equipment and games aimed at teaching an understanding of self-recognition, understanding, caring and respect, responsibility to society and a re-evaluation and orientation of life. TREASURE HOUSE (second floor) – a series of fifteen “discovery galleries” with interactive exhibits designed for children aged 3-15. Aimed at explaining an understanding of life and understanding critical thinking. NATURE GARDEN – the Nature Garden, adjacent to Noah’s Ark and accessed by a separate entrance, is intended to be “an art piece for enjoyment, to stimulate inner reflection, and inspire and appreciation for the loving relationships in the beauty of nature”. 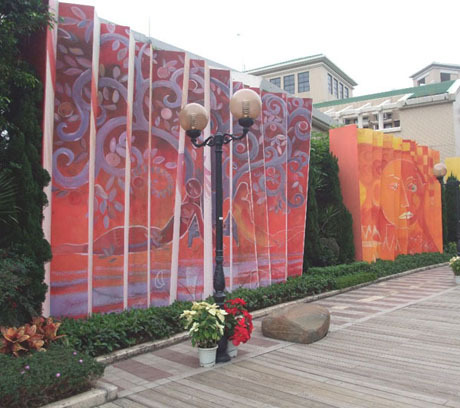 It contains a “Rainbow Wall” with seven panels each in one of the rainbow colours designed for visitors to “reflect on, imagine and participate in the process of creation”, themed gardens, river, ponds, forest, playground, windmill station, hilltop lookout with "big bird ready to flutter and soar" and with panoramic views of the Kap Shui Mun Bridge. 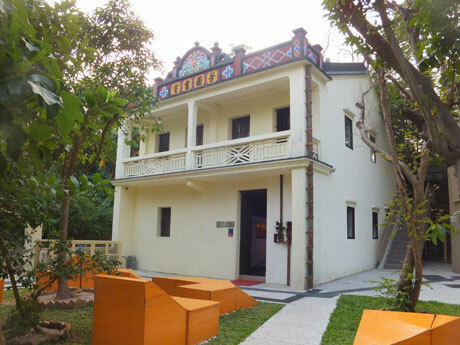 The Garden also houses a Heritage Centre where cultural relics including a Tang Dynasty Lime Kiln and Qing Dynasty Brick Kiln from Ma Wan are displayed and there is also a Liberal Learning Centre operated by HK Professional Training Alliance (Protrain). The Nature Garden will also be the location for the Solar Tower (scheduled for completion two years after a new road network has been built at Ma Wan) and this will be an education centre with exhibitions on the history of Chinese astronomy, solar energy and related information and it will have a solar telescope available for visitors to view the solar system. Entry to the Nature Garden is free during public opening times (see “Opening Hours” above). SOLAR TOWER - the Solar Tower, opened in 2012, features a 350mm diameter vacuum telescope which allows visitors to view activity on the surface of the Sun in real time. Solar Tower also contains various solar and astronomical exhibits where visitors can learn all about the solar system and gain a deeper understanding of the universe. NOAH’S HALL on the ground floor of the Ark is a 600-seat multi-function Hall with stage and audio-visual facilities. NOAH’S STADIUM is an outdoor 650-seat stadium for sports and special events. NOAH’S PLAZA on the outdoor deck of the Ark is a 300-person capacity venue suitable for day and night events lighting and interchangeable layout patterns. 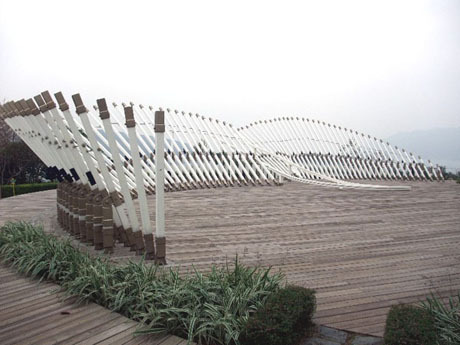 SUNRISE AMPHITHEATRE is a 200-seat outdoor gathering facility with views of Tsing Ma Bridge and sea. ARK THEATRE – Multi-media theatre equipped with Surround-Sound and suitable for concerts, meetings, seminars and shows. FUNCTION ROOMS – there are three function rooms catering for 60 to 100 people suitable for seminars, meetings and parties. 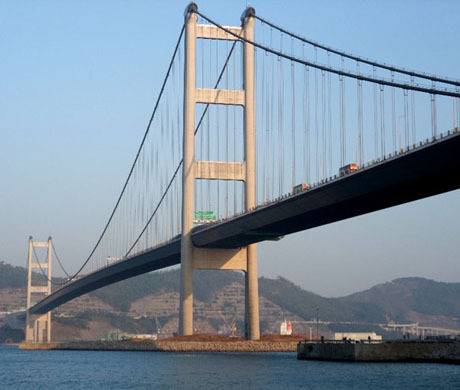 HARVEST RESTAURANT – located on the ground floor with sea views and views of both the Tsing Ma Bridge and Ting Kau Bridge. The restaurant offers affordable international cuisine and snacks. There is also an outside dining area. SHOPS – There are three shops, each operated by different Christian organisations. Rainbow Gallery (St James’ Settlement) sells gifts produced by disabled and disadvantaged people, Kid’s Deck (Angela Luk’s Educational Foundation) has a range of educational toys and Marvels (The Media Evangelism Ltd) has souvenirs and gifts themed on the messages of life and love. 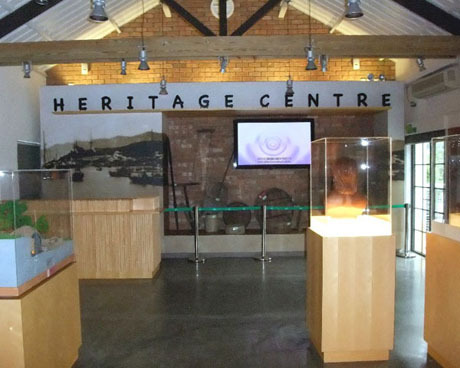 HERITAGE CENTRE- Located in the Nature Garden the Heritage Centre displays cultural artefacts historical artefacts including a valuable Tang Dynasty Lime Kiln and Qing Dynasty Brick Kiln. FONG YUEN STUDY HALL - Located a few minutes walk from Noah's Ark at Tin Liu Village the Fong Yuen Study Hall was built by the Tang Clan during the 1920's and 30's. The dwindling island student population it stopped serving as an educational institution but the building was renovated under the government's "Revitalising Historic Buildings through Partnership Scheme" and reopened in 2013 into a tourism and Chinese culture centre and museum operated by the Yuen Yuen Institute. The building has interesting architectural features with both Chinese and Western characteristics and houses an exhibition area depicting the history and culture of Ma Wan. Opening hours - Mondays to Fridays 9am to 5pm, Saturdays, Sundays and public holidays 9am to 6pm.